PU has better resistance to impacts. Vertex climbing holds use the latest, revolutionary formula of Polyurethane resin Dannom♦nd. Dannom♦nd is a high-performance pure Polyurethane used primarily in the production of indoor climbing holds. Characteristics like higher wear resistance, bright colors, dry soft texture and superior strength make it the first choice material for Climbing holds. Route setters and gym owners alike appreciate the long life and ease of route setting it imparts in the holds. Dannom♦nd material combined with a relatively rough texture can create a very long lasting textured hold. Until now the main disadvantage of Polyurethane climbing holds in comparison to polyester, has been wear resistance. Dannom♦nd changes the dynamic. The key to developing wear resistant materials is to understand what is happening during the wear process – when holds are on the climbing wall and being climbed on. Composite X developed a test machine that creates similar conditions to the climbing wall and is able to give a comparative result within an hour. The test samples are worn down. 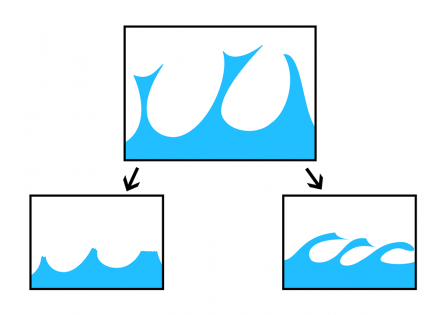 The samples that lose the least mass during the test are the best materials. Composite X compared the results of the Dannom♦nd formula with that of many existing hold formulations and the difference in results were quite revealing. Here are a few examples. Results are in mg Loss. Dannom♦nd wears down your skin less than virtually all other climbing hold materials. This allows for longer training sessions. Dannom♦nd is available in 8 bright colors. Dannom♦nd formula contains a high level of UV stabilizing agent. 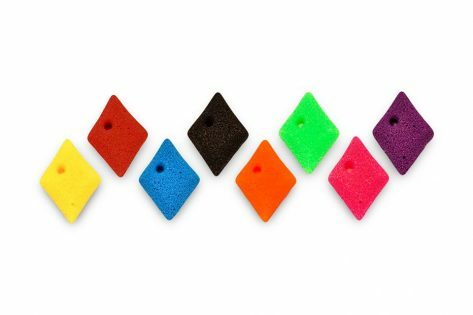 This gives an excellent Color stability for indoor climbing walls and reasonable outdoor stability. Safety is built into Dannom♦nd. Unlike the majority of materials used for Climbing holds – Dannom♦nd will not crack and give rise to a sudden safety issue – rather it will bend if put under extreme conditions. 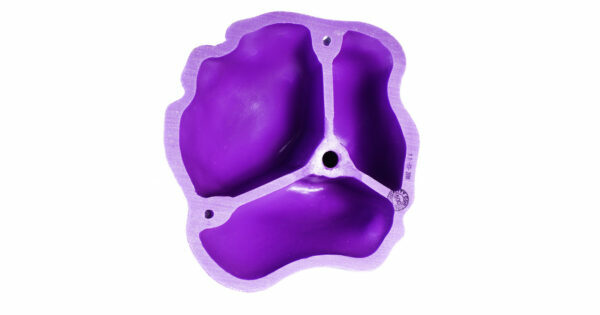 Dannom♦nd has extremely high Impact and strength resistance even in badly designed climbing holds. Its superior properties can to some degree absorb and make safe design errors. Holds made from Dannom♦nd are suitable on almost all surfaces from plywood to concrete. The use of the first-rate type of polyurethane and careful control of every stage of producing process make Vertex climbing holds of top quality. Each one of our climbing holds has its own bolt depending on the depth of the fixation hole. That way the head of the bolt is on the surface of the hold. There is no risk the climber to use the hole where is the bolt in case that the bolt is short and cause himself an injury during his climbing. We offer our sets with bolts with conic head by default. If our clients prefer bolts with cylindrical heads that have to be specified during the ordering process. That reduces their weight and makes them easier for assembling routes on the climbing walls. Once the holds are screwed into the wall, it is normal for them to become dirty from the hands covered with magnesium and climbing shoes. With time, that can affect the grid quality and the safety and pleasure of your climb. We advise you to check the conditions of the holds and to clean them periodically.